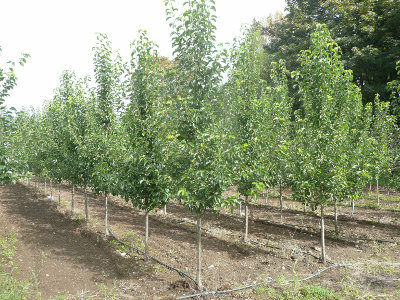 Introduced in 1965, the Chanticleer pear tree also known scientifically as Pyrus calleryana, is a shallow rooted pear tree that tolerates wide range of soils including moist, dry but not continually clay, alkaline and wet soils. This tree originates from China and it is one of the ornamental pear trees. It has a tailored appearance that makes it look narrow. They require little pruning because they exhibit a tight branching structure. Multiple leaders are also common with the Chanticleer pear tree. This is a tough pear fruit tree, which can resist fireblight and urban pollution with ease. Its white scented flowers normally blossoms in the spring that will eventually produce, round, small, hard bitter pear fruits. Its dark green summer leaves turn gold red or red purple to orange in the fall. This pear tree species is small and can fit well in variety of gardens. It is one of the widely known deciduous trees that shade its leaves in winter. They maintain their charming attractiveness throughout the year, with their elegant white flowers during the spring and their silhouetting shapes during winter. They thrive well in climate zone 1 through 9 and even 16. Sometimes, they can do well in climate zone 16. The tree has uniform habit and reputable resistance to storm damage and diseases. They are adaptable to wide variety of soils. They are drought resistant species, which maintain their oval, pyramidal or erect shape throughout the year. They make good trees for sidewalks and street. They don’t produce above-ground roots, which normally destroy the pavement, and hence they are good garden trees. They should be planted at least 10 feet away from buildings and swimming pools. When planting these trees in the same space, allow 18 feet in between the trees. Chanticleer pear tree are relatively smaller and narrower than their ornamental pear tree counterparts. They are oval in shape and widest (between 15 and 25 feet) where the branches begin but the branches taper into a single point at the top of the tree. They grow up to a height of 35 feet but some may grow as tall as 40 feet. The leaves are dark green and glossy during summer while the bark is reddish brown throughout the year. The tree features orange or golden red to purple red colors during fall.